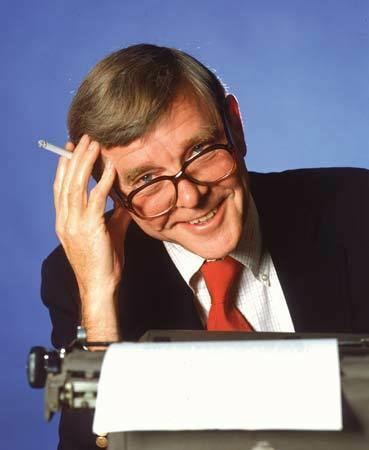 The humorist Russell Baker died Monday at the age of 93 at his home in Virginia. This is my piece on him based on an interview I did with him in 1994 for The Hartford Courant. When last we left Russell Baker, he was having a literary anxiety attack, fretting about what in the world to say in his speech for the Mark Twain House. "I'm sitting here biting my nails," he says wryly phone from his home in his native Virginia. "I'm going to look up the word `tropism' and see what it means." In January, Baker wrote in his New York Times Observer humor column that perhaps he might speak in Hartford on "Holistic Tropism and Subliminal Lamentation in Mark Twain's Mississippi Writings: A Suppressed Struggle Between Conscience and Riparian Rights." "I think I picked that one because I don't know what any of those words mean," he says, his voice as homey and inviting as honey glaze on a Virginia ham. The Pulitzer Prize-winning writer - one for commentary, another for biography for his "Growing Up" (Nal/Dutton) - will give the Mark Twain House's new Clemens Lecture Friday at 7:30 p.m. at the Town and County Club in Hartford. The event is sold out. Baker recalls words of wisdom given to him by the late Secretary of State Dean Acheson on why people agree to such public appearances. Russell remembers Acheson saying: "In the first place, it's almost impossible to say `no' to people. And in the second, they always ask you so far in advance that you figure, `In the meantime, I'll get lucky and die, and I won't have to make the speech.' " With about 48 hours to go before his speech, Baker's health seems to be holding up pretty well. And the Mark Twain staff reports that no acts of nature, as they like to say in insurance riders, have so far altered the scheduling.